Hello readers! so, I have mentioned previously on my Valentines day list that Mortal Kombat X was the number one game I wanted to get my hands on this year, and that fact still remains true today. With the game’s release date right around the corner I thought it would be a good idea to express my expectations of the game as well as various facts and pricing information. So, first things first, the game is being developed by NetherRealm Studios and published by Warner Bros. Interactive. These two companies have been working together for quite some time and they have released some of the best fighting games in recent years, most notably Mortal Kombat 9 and Injustice: Gods Among Us. Together they do a great job of getting the rights to use interesting movie characters in fighting games such as Freddy in MK9. Because most of the rights to the bonus characters are owned by Warner Bros, it gives the developer a chance to include characters from popular movies that coincidentally fit with the Mortal Kombat universe. Having this option gives us a chance to play as fan favorite characters and unleash their awesomeness as a whole, in a new and refreshing way, which only adds to their popularity. This time around, the biggest characters that were rumored to be included in the Mortal Kombat X roster, were Predator (from the classic sci-fi action movie), Spawn ( the dark comic book anti hero), and Jason (from the Friday horror movies). As of right now it has been officially announced by NetherRealm and Xbox that both the Predator and Jason Voorhees will be available in the game, but will be included in a DLC pack. Personally I am ecstatic for Predator to be in the game. I feel that his alien abilities will translate well into the game since he has multiple weapons and gadgets on top of his active camouflage and sheer strength. I also feel that his brutal hunting method seems perfect for the already ultra violent nature of the Mortal Kombat series. His moves could potentially vary between ranged projectiles with his shoulder mounted cannon, turning fully invisible, and close quarters attacks with his double arm blades. Now overall, I am simply expecting the game to introduce a new level of depth to the series. What I mean by this is that I expect MKX to have a deeper and more realized storyline for its campaign, more variety in its modes and more character options that will enhance the overall gaming experience. Now even though the last entry in the series had a few alternate modes, none of them felt very entertaining for longer then a few moments besides the campaign and multiplayer mode. I am hoping that MKX completely revamps the series by adding new fight modes and improving on the already stellar fighting mechanics from MK9 and just add on the bells and whistles that boost the replay-ability of the game. I am expecting to see lots of DLC in the future, from alternate character skins, to more classic characters, guest characters, and hidden finishing moves. So far the game seems to be hitting all the marks of my expectations, but until I have the game in my hands it will be hard to say for sure. All of the trailers continue to show off its amazing graphics and almost never-ending roster of characters, but I have a feeling that not every character in the trailers are playable. Either way the game still looks fantastic and hopefully it lives up to the hype and pleases fans across the board. On a quick side note I will update my blog on MKX again when I find out anymore news about upcoming characters such as Spawn and any others as soon as I am aware that they have been officially confirmed by the developer. The gameplay video below is from IGN. Premium Edition – starting at $89.99 – which is an exclusive digital download of the game for all consoles and PC and includes the Kombat pack. Limited Edition – starting at $99.99 – which comes with the game, an exclusive Kold War skin for Scorpion, unspecific themed skins, the Kombat pack DLC and exclusive Key Art. Kollectors Edition – starting at $149.99 – which comes with the game, an exclusive custom designed Scorpion figure designed by a company called Coarse and a certificate of Authenticity. 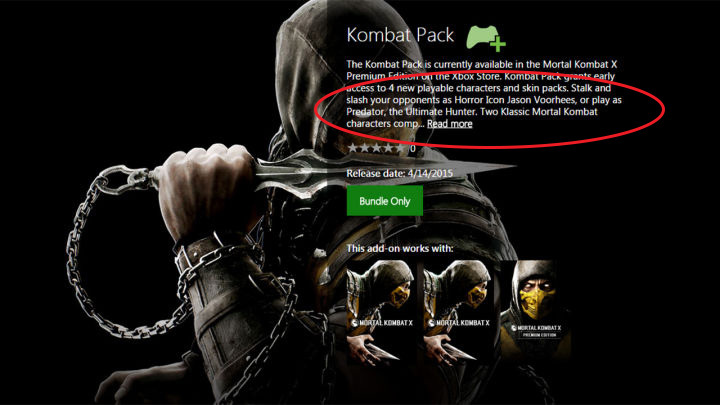 On top of this, this version of the game also has the exclusive Gold Scorpion Skin and the Kombat pack DLC. And finally: Kollectors Import Edition – starting at $179.99 – which comes with a Scorpion figure, a steel case and a steel card, the Mortal Kombat X: Blood Ties comic vol 1, Gold Scorpion Skin and the Kombat pack DLC. This box is imported from Europe. Just so everyone is aware, all versions will offer GORO for a limited time but only through preorder!!! Mortal Kombat X will be released on Tuesday, April 14th, 2015. Thanks for taking the time to read this post, if you liked it please comment and let me know which version you are interested in purchasing and why. And please feel free to come back to read more posts of upcoming games and other game related topics. I heard Ermac has some really “Flared”-up skills in MKX… I also want to use Erron Black, I heard he some sort of “Gun” slinger! SOOOOOOOOOOOOOOOOOOOOOO Jason is Destroying Predator right? ALso Thanks for the Well informed Blog on the game. Makes me want to buy a second copy.